*Apply sun shades on the windows of your car, preventing your babies and families from harmful UV rays and glaring sunlight. It is more comfortable to nap and watch videos in the car and help to keep your car interior cooler even if it sits under the sun for hours. *Premium and tightly woven mesh material makes it durable to use. 80 GSM of fabric provides more protection to you. Greatly block 98% of UV rays, which is more effective than other shades with 55 GSM of fabric. Add it to your cart now, and get the effective UV protection. （1）Firstly, wipe the widow with a wet cloth to clean the dust. （2）Secondly, place the window shade on the window with static cling side. （3）Finally, give pressure to whole window shade to make it firmly cling to the window. 1. Please fold the shade as the picture shows. Don't fold in half. 2. The dust may influence the effect of static cling, so clean the window and the shade to make it work normally. 3. There may be some wrinkles on the shade. It is a normal phenomenon because of storage. ONE-YEAR warranty for free replacement or full refund, please contact us via E-mail if you have any problems about quality, we will solve your problems as soon as possible. 《UV Protection》 The sunshade is made of 80 GSM mesh material which helps block 98% of ultraviolet but does not obstruct your sight. No glaring sunlight irradiate in the car. 《Larger Size》 20" x 12" car sun shade is larger than most of car shade in markets. Perfectly install them on any size of vehicles, offering maximum UV protection to your babies. 《Easy to Install》 No suction cup or adhesive needed. The static cling surface makes installation and removal easier and faster. The sunshade clings to the windows in seconds. 《Easy to Store》 The steel wire ring of shade ensures easy folding. 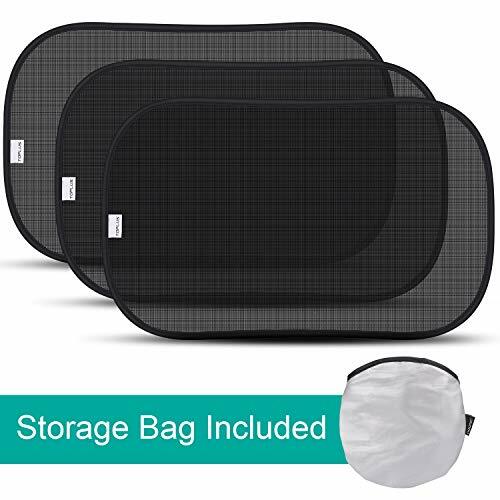 Easily store it into the provided storage bag when disuse, and pop-open instantly when needed. 《One Year Warranty》 Provide 12 month replacement and refund warranty. Please contact us immediately if you are unhappy with our products or meet some issues. If you have any questions about this product by IILIUXE, contact us by completing and submitting the form below. If you are looking for a specif part number, please include it with your message.